It’s once again all systems go on the planning and development front in Kent with the political landscape now sorted after the recent general and local elections. There have been a number of important decisions and announcements on significant planning applications. Proposed plans for commercial development at Waterside Park near junction 8 of the M20 – which would support the economic success of Maidstone – have been the subject of a planning inquiry, with a decision expected within two months. Canterbury City Council has appointed Bouygues to deliver an exciting leisure and residential scheme at Kingsmead on the Sturry Road, which will enter planning early next year. Just down the road in Thanington, Pentland Homes has teamed up with Tory Family Foundation charity and developer Mark Quinn to bring forward plans for 750 homes, a primary school, community facilities and a £7m palliative care facility for Canterbury-based Pilgrims Hospice. In Tunbridge Wells, the former cinema site is back on the market with Carlyle Group expected to announce a new owner in the coming weeks. The delays to the redevelopment, largely due to Waitrose’s decision not to be an anchor tenant, have led to widespread public anger in the west Kent town. Manston Airport remains firmly in the news, with the new owners unveiling their development concepts just before the election. Thanet’s recently elected local UKIP and Conservative councillors have voted to review the CPO for the now closed airport. This was previously rejected by the former Labour administration. Local Conservative MPs Sir Roger Gale and Craig Mackinlay both continue to push the case for the CPO. The proposed cost of Paramount Park London has risen by an eye-watering £1.2bn to £3.2bn but the people behind the project, and their backers, remain confident they can secure 27,000 jobs for the Kent economy and create a visitor destination of European significance. In terms of retail, there’s been little to shout about. Construction of the approved Aldi in Herne Bay has been delayed a month and Tesco is still trying to divest itself of its sites in Dartford and Strood. Swale Borough Council has unanimously rejected a retrospective application relating to 27 homes almost completed on the Isle of Sheppey. Unfortunately for Moat Housing, the social homes were constructed up to 1.7m higher than agreed in the original planning application and local residents objected. 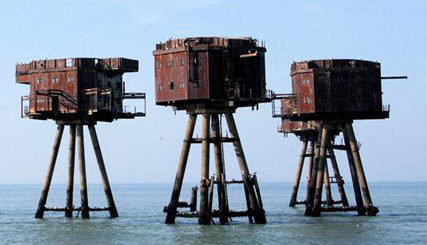 However, the award for the most bizarre proposal of the month goes to plans to create a 40 bedroom hotel, complete with helipad, on the Red Sands sea forts, originally built to protect London in the River Thames during WWII.